Those who have read what I’ve written about Louisiana—in either a “jazz” or fly fishing context—know that I am positively smitten with the sounds and casting adventures that were/are born on the bayou. Having just spent another week there, absorbing the unique music and fishing experiences, it struck me that my appreciation for this region is born out of respect for “improv” culture. In the music context, the reasons are pretty obvious. Thousands of musicians (starting with Louis Armstrong, the Marsalis family, and many others) have literally defined jazz in a New Orleans style by venturing far away from the standards. The fishing improv culture is also the reason why you go to Louisiana. My only gripe with fishing on the bayou for redfish is that it is so weather-dependent. You crave clear skies to see the fish in the murky water. Heavy wind will screw up your chances. The tides always influence matters, but how those tides interact with wind speeds and directions, air temperatures, and other factors create thousands of variables that can never be predicted and planned for. As such, the fishing—when you step onto the casting deck of a skiff—is a helluva lot like stepping onto a stage, where you never know for sure how the flow of any given moment will transpire, nor how your audience will react. Sometimes, when the weather is just right, you find yourself lacing long, classic casts at orange targets that stick out like pumpkins in a dirty green field. Other times, when your vision is limited, you find yourself chopping, slashing, and making things happen—short casts in short bursts, drop it here, drop it there. You do what you can, however you can, and hope for the best. Ultimately, that total experience comes together in a way that hones the skill of the angler. Not as a “pure caster,” rather an improvisation maestro. 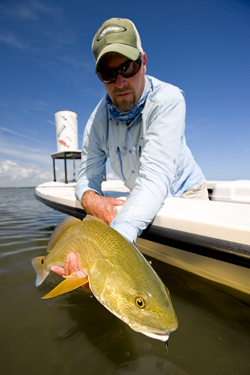 The good news is that most of those redfish in the marsh are willing players. Like fans of good music, they’ll do their part and reciprocate, if you do your thing. You might not catch the mighty “Swamp Donkey” with any old flick of the wrist, but then again you might just land in a moment and surprise yourself. And the best thing is, you can take that fast-shooting, quick-thinking, reactive, soul-casting game anywhere in this entire world, and use it for for effect. Trout world, salmon world, steelhead world, even bass or carp world—the improv game is, at least in my mind, best created in the Bayou. You may falter, and fumble, and wonder. But in the end, you’ll rely on instinct. And, as that happens, you’ll get a whole lot better.